Microbial Misadventures is a recurring series on Body Horrors looking at instances and incidents where human meets microbe in novel and unusual circumstances that challenge our assumptions about how infections are spread. Shout “fire” in a crowded room and watch the occupants fly for the exits. Speak the word “malaria” and watch as all within earshot reach for the nearest can of DEET. The incontrovertible fact of malaria’s relationship with mosquitos is one that has been known since Sir Ronald Ross discovered the parasite nesting within the belly of a mosquito in 1897. Such is the natural order, an incontestable necessity of the protozoan parasite’s life cycle. Humans, however, are rather adept at bucking that system – see cronuts, labradoodles, and the college bowl ranking system for examples. Also due to the interference of mankind, as a 1995 Taiwanese medical mystery proved, malaria can indeed be spread without the assistance of their obnoxious arthropod cronies. A photomicrograph of Plasmodium malariae showing the merozoite stage of the parasite’s life cycle. These red blood cells will release merozoite that will eventually develop into male and female gametocytes. Image: CDC. Malaria is a protozoan parasite of the rather large genus Plasmodium that has long exploited the tenuous relationship between humans and mosquitos for its own unscrupulous replicative means, infecting humans through the the efficient delivery system of the mosquito’s syringe-like proboscis. This disease is nothing new; it has plagued humans since the time of Hippocrates when the Romans avoided the stretch of Pontine marshes for fear of contracting the “bad air” from which malaria derives its name. 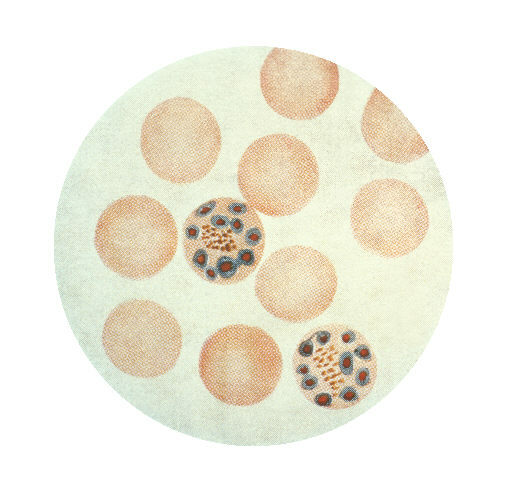 While there are over a hundred species of Plasmodium malaria, there are just five species that cause disease in humans. Those five – P. falciparum, P. vivax, P. malariae, P. ovale and P. knowlesi – cause an estimated 200 million infections and 600,000 deaths annually posing an enormous burden upon developing countries that have been unable to eradicate the parasite (1). But for most of us, our relationship with malaria consists solely of what little is heard through the news or, occasionally, an intimate encounter with the disease while sightseeing or working internationally. This was just the situation in the case of a Taiwanese businessmen who traveled to Nigeria in 1995 and inadvertently caused a small outbreak in a general teaching hospital in Taipei, a country free of malaria since its eradication in the 1960s (2). Until this uncommon outbreak, every single case of malaria in Taipei had been directly traced to an individual’s recent travels to an endemic region. Two weeks after the hospital admission of our index case, our ill businessman, an additional four patients developed unusual fevers that were identified as being malarial in origin. Yet none of these group of five patients shared a history of blood transfusions nor any common exposures, aside from treatment within the same hospital, that would predispose them to malaria. The materialization of this infection in unrelated hospitalized patients without any recent history of international travel led, of course, to the supposition that mosquitoes had invaded the hospital, fed on the jet-setting businessmen and had gone on to infect patients. The obvious step in controlling this outbreak would be to thoroughly hose down the hospital with mosquito repellent with the expectation of putting an end to this imported outbreak. To that end, mosquitos around the hospital were trapped for testing and summarily executed en masse. However, surveillance of the hospital’s surrounding neighborhoods produced no evidence of mosquitoes carrying malaria and yet still the parasite surfaced in two more patients. Greater scrutiny into the collective medical history of all infected patients at the hospital surrendered an unusual yet crucial clue that helped to crack this “malaria without the mozzies” mystery: every single patient had undergone a procedure using the same computed tomographic (CT) scanner, an important instrument for medical imaging, and developed symptoms of malaria 11 to 16 days later. The computer log sheet noted that the electricity had been interrupted for a short time during the examination of the index case … it was found that approximately 0.25 mL of patient blood was withdrawn back into catheter B when the electricity was interrupted during examination with the Imatron scanner. The density and viscosity of blood is less than that of the contrast medium, so the blood floated to a higher level during the mixing of blood with the contrast medium (2). This outbreak resulted from the convergence of a series of curious events – a traveler carrying malaria from abroad, a disruptive loss of electricity, a fatal failure of medical technology, and the intravenous delivery of a parasite sans its mosquito partner in crime. A total of six patients were accidentally injected with contrast medium infected with malarial blood from the businessmen. Four would die from complications of the infection. Nosocomial, or hospital-spread, infections are nothing new but malaria infections usually begin outside of the hospital, not within, and natural transmission of the parasite deeply relies on the little needlenose of mosquitoes. Of course, malaria can be spread by other means – it just needs a helping hand. As keenly demonstrated in Taiwan nearly 20 years ago, the entire ouborous-like life cycle of malaria was bypassed for the far more efficient and dangerous route of direct contact with infected blood. Bizarre as the Taiwanese case may seem, transfusion-related malaria has consistently proven to be the most common hospital-borne parasitic infection since it was first described in 1911 (3). There have been over 2,000 documented cases showcasing a variety of colorful, man-made methods of spreading malaria, including blood transfusions, organ transplants, or through the always-popular needle-stick injuries. Two factors combine to make such parenteral transmission of parasites a potentially severe problem when it does occur. First, low index of suspicion results in diagnostic delay and potentially more severe disease. Second, the recipients of component transfusion or organ transplantation are often immunocompromised hosts and thus more likely to develop severe illness or death from the acquired parasitic infection (3). The transmission of malaria through syringes has also been well demonstrated outside of hospitals, in intravenous drug users that share contaminated needles (7). Though this form of transmission is but a strange blip in the hundreds of thousands of malaria cases that occur via the blood-sucking bite of a desperate mosquito, these sorts of cases have implications for the maintenance of infection-control practices of both hospital equipment and staff. Malaria already has the upper hand in our public health battle to fight global diseases; it doesn’t need a boost from within our hospital walls. A great review article on “Transfusion-transmitted parasitic infections” covering the logistical lab challenges faced with detecting parasites in body tissue products. The ancient Romans tackled the issue of malaria with “the perfect public works project,” the Cloaca Maxima or “Greatest Sewer”. 1) World Health Organization (March 2014) Fact sheet on malaria. Accessed March 27, 2014 here.